Thanksgiving is almost here, and that means an abundance of delicious food. However, many food items that people enjoy aren’t healthy for pets to consume. This is important to remember during holiday meals, when dogs and cats beg for table scraps and guests might fall for those cute faces. To ensure your pets remain healthy this Thanksgiving, below are six dishes to keep away from your pets. Be sure to inform your family and dinner guests about these potentially toxic or dangerous foods so they do not feed them to your pets. Thanksgiving dressing is often made with onions, scallions or garlic. These ingredients are extremely toxic to dogs and cats and can cause a life-threatening anemia (destruction of the red blood cells). It’s best to avoid feeding any amount of stuffing to pets. Ham and other pork products can cause pancreatitis, upset stomach, vomiting and diarrhea. 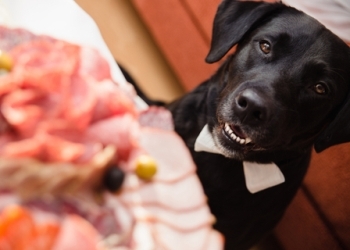 Ham tends to be high in fat as well, which can lead to obesity in pets. Even a small amount of ham can contribute a very large amount of calories in a small dog or cat. While potatoes are safe for pets to eat, mashed potatoes usually contain butter and milk, which can cause diarrhea in pets that experience lactose intolerance. Additionally, some recipes call for onion powder or garlic, which are very toxic to pets. There are many salads served at Thanksgiving that include grapes or raisins as an ingredient, from fruit salad, to waldorf salad, to ambrosia. However, grapes and raisins are very toxic and potentially deadly. Grapes can cause severe, irreversible and sometimes fatal kidney failure in dogs. Be sure to keep all dishes that include grapes and raisins away from pets. While pumpkin pie is the most famous Thanksgiving dessert, many people offer a variety of desserts at Thanksgiving which include chocolate. Chocolate is toxic to dogs and cats, yet dogs love the smell and taste of it. The darker the chocolate, the more toxic it is. Keep all chocolate desserts out of the reach of pets to prevent an emergency trip to the veterinarian. If your pets ingest any of these foods this Thanksgiving, be sure to call your veterinarian immediately. Early action may prevent more costly and serious complications from developing. Have a happy and safe Thanksgiving!